Located by Edinburgh Castle, the venue is a 2-minute walk from Edinburgh International Conference Centre. The Linux Foundation has not contracted a block of rooms at the hotels listed below and cannot guarantee rates or availability. The following hotel blocks are closed – if you wish to book at any of these hotels, please contact the hotel directly for rates and availability. Important: The Linux Foundation will never reach out to attendees by phone to make hotel reservations for our conferences. Please be advised that the most secure way to book in our discounted room block is by using the direct booking like provided above, or by calling the hotel directly. If you do receive a phone call from someone claiming to be with The Linux Foundation or the hotel and they attempt to sell you a hotel room, please email us at events@lfenergy.org. If you have any questions related to the room block or conference hotel, please email the events team at events@lfenergy.org. Car parking is available at the Sheraton Grand Hotel & Spa on the bottom two floors of the adjacent One Spa building. The car park can be accessed from West Approach Road. The cost is £5.00 – £24.00. Visit Parkopedia to see currently available car parks, pricing, and locations. Bus, Rail, and Tram are all options to/from the airport, as well as within Edinburgh city limits. 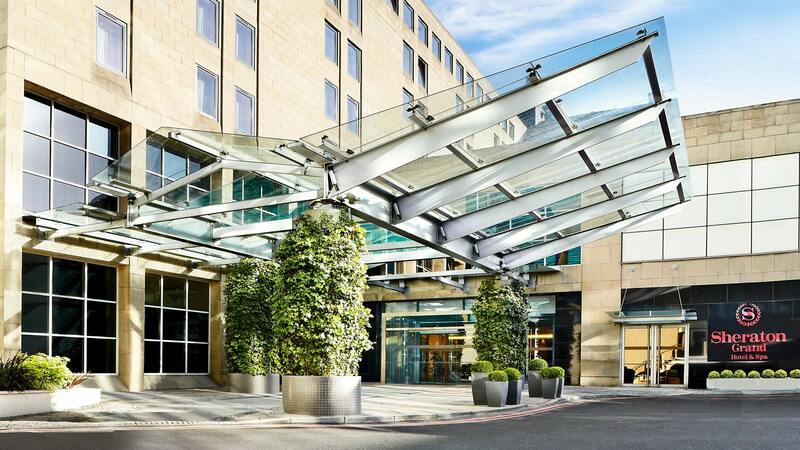 The Sheraton Grand is located near the Shandwick Place stop (Stop SC).